Paddling technique is one of the most important skills in surfing. You spend most of your time paddling around during your session. Having the right technique will make your paddling more effective and less tiring. You should lie on the board so that the nose is only a few inches above the water. If you lay too far back on the board and the nose is way up in the air, your board will not plane across the surface and you’ll be pushing against the water. On the other hand, if you’re too far forward and the nose is under the water, you won’t go anywhere and you’ll probably just end up falling off! Most beginners make the mistake of being too far back on their board. Once you’ve got yourself lying at the right spot on your board, the next step is to arch your back a bit so your weight is on the bottom of your rib cage. Your feet should be together and lifted out of the water so they don’t drag. This position is HARD for the very new because of the muscles involved. You’re going to get tired quickly, but you’ll soon build up the necessary muscles. The arm stroke itself should be deep and fully extended. Reach your arm fully out towards the nose of the board, cup your hands with your fingers spread apart just a little, and bring your arm down through the water making a small “S” shape that goes slightly under your board. This is the most efficient way to paddle. Then do it again with your other arm. Rotating from arm to arm like freestyle swimming. Calm, deliberate strokes are the key to this. Before you try to paddle to the outside, past the breaking waves, practice your paddling technique on the inside in the whitewater. Once you’re good at pushing the board for momentum in the whitewater, you can start to try and paddle to gain momentum. As the whitewater comes towards you, climb on the board and start paddling towards shore. Once the whitewater catches you, grab the rails and hang on! Catching and riding on your belly or prone in the whitewater is one of the first steps to surfing. This step serves mainly to help you get accustomed to your board and to the water. You’ll notice that after a wave breaks it creates a wall of whitewater that rushes in towards shore. Take your board under your arm and walk the board out into the water. Once you get to about waist high water you can rest the board on the water. It’s important to note that you should never put the board in front of you. The board should be kept at your side with the nose pointing towards the waves. When you’re far enough out into the whitewater, turn around and point the nose of the board towards the shore and wait for another line of whitewater. Just before it hits you, push the board towards shore and jump on top of the board so you’re riding on your stomach. You should get a little momentum towards shore before the whitewater hits, otherwise the board will get thrown around. The wave will also have to do too much work to get the board going. You’re surfing! Go out and do it again. Riding on your stomach like this might seem silly, but it’s a great way to get used to how your board moves around in the water. Experienced surfers often ride the whitewater in after their session on their belly. Standing up is the main goal of surfing. Now that you have gotten the hang of belly boarding on your surfboard, it is time to stand up on your board and finally surf. All the pop up practice that you did on the beach is now going to come into play. 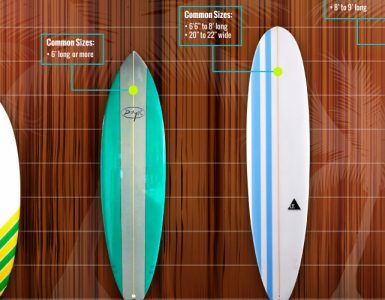 Everything l explained in the previous stages of this guide is all about preparing the surfboard and yourself for the stand up. If you have ever skateboarded or snow boarded you are already familiar with your stance. 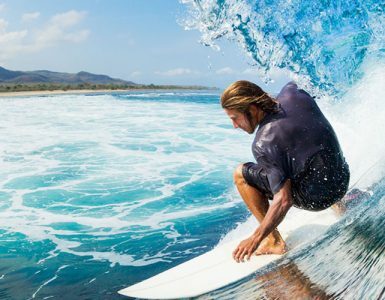 Most people surf with their left leg in front. This is considered natural. However, if you were to prefer your right leg forward you would be considered a goofy. In any event, the strongest leg usually goes at the back. You may want to play around with this to see which you are more comfortable with. Some newbie surfers may learn to stand in unbroken waves, but I would steer clear of that unless you are with an expert. There are two different methods of standing up - one is the jump up method and the other is called the step-up method. The jump up method is more preferred as it gets you to your feet in one swift movement. The step up often gains better results for beginners who may not possess the body strength to spring to their feet in one movement. To begin with, catch a wall of whitewater like you’ve been doing. As soon as the board starts to stabilize and glide in front of the whitewater, pop up to your feet! Although it sounds quite simple, it is very difficult. Some people will want to get to their knees first and use the step-up method. This is OK for newbies, but I would caution against making this a habit. You should be able to smoothly pop up from a prone to standing position. This takes time to get the hang of, and it’s a different motion than getting to your knees. Try to get your muscle memory more in tune it the jump up method. Remember, just like bicycles, surfboards are more stable at speed. Therefore, don’t be afraid of standing up if the whitewater is pushing your board fast. In fact, it’s advisable to grab this wave of whitewater. Once you finally get to your feet, even for a just few seconds, you are surfing! Once you’ve mastered the whitewater it will then be time to ply all that you’ve learned and go after unbroken waves.